​I can evaluate the consequences of the Teapot Dome Scandal. Directions: The first thing you need to do is read about the Teapot Dome Scandal. Make sure that you are looking for the consequences that resulted from the Teapot Dome Scandal during the reading. 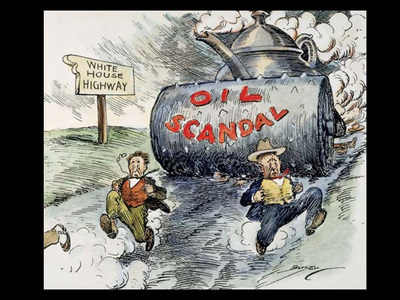 The Teapot Dome Scandal was a scandal in the 1920s that involved big oil companies, high ranking government officials, bribery, and corruption. It was the most serious scandal in the country’s history until that time. It all started with an oil reserve near a rock formation north of Casper, Wyoming that looked just like a teapot. 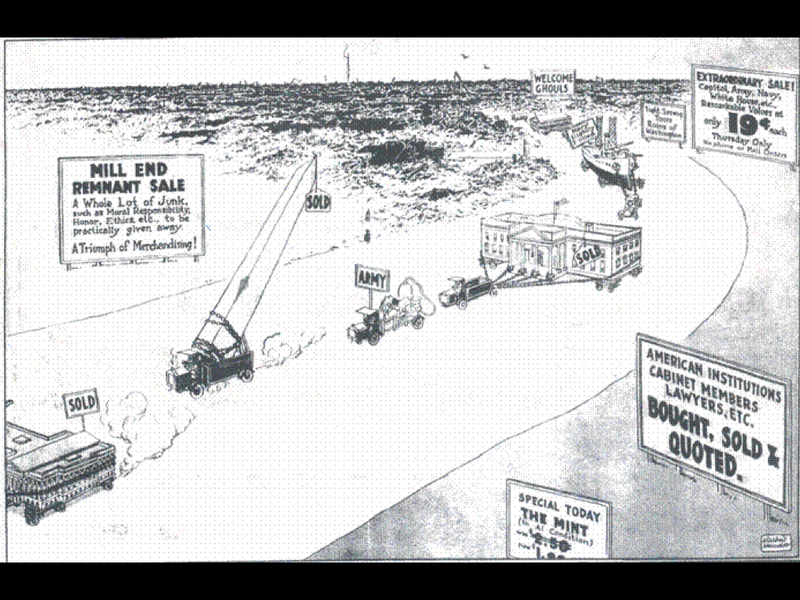 The oil reserve at Teapot Dome came into the national spotlight a few decades before when U.S. Navy officials and President Theodore Roosevelt realized that they would need a better resource than coal to fuel naval ships. Theodore Roosevelt was president from 1901 - 1909. Before he was president, he had been the Assistant Secretary of the Navy. He realized the importance of a strong navy and knew that to keep a big, strong navy, the United States would need a better energy source than coal. Roosevelt and navy officials discovered that petroleum, a form of oil, was a much better energy source and they worked to convert U.S. Naval ships to petroleum. As more and more ships were converted to oil fueled ships, naval officials began to worry that federally owned oil reserves might run out of oil. So, Navy officials asked Congress to set aside federally owned oil reserves for the navy that would not be drilled unless a national emergency made it necessary. One of these was called Teapot Dome. It was called Teapot Dome because it was near an unusual rock formation that looked like a teapot. There were many oil companies that wanted to have the opportunity to drill on this federally reserved land. After Warren G. Harding was elected president in 1920, he chose his cabinet. Cabinet members are advisors to the president. They are called "secretaries". The president chooses them because each secretary has special knowledge, skills, or experience in a matter. Because they have a better understanding of the matter, they can advise the president when making a decision, so that he can make the best decisions possible. The problem with Warren G. Hardings cabinet was that he appointed some of his friends to cabinet positions and some of them were not qualified to be in the positions they held. Others were corrupt. They used their position in the government for personal gains. Personal gains are when government officials are given privileges, gifts, and money to use for themselves and not on the American people. Albert Fall was one of these cabinet members who was out for personal gain. Fall had been a poker-playing friend of Harding's. Harding made Fall the Secretary of the Interior. The United States Department of the Interior is the federal, executive department responsible for making decisions about U.S. land and natural resources. He made very poor decisions that led to the Teapot Dome Scandal. Not long after Albert Fall was appointed to the position, he convinced President Harding to allow the Department of the Interior to control navy oil reserves. Fall said that the Department of the Interior would make sure no one drilled on navy oil reserves. Once the Teapot Dome oil field was under Fall's control, he made secret deals with two well-known oilmen, Edward Doheny and Harry Sinclair. Both men were close friends of Fall's. They paid Fall bribes to allow them to drill on federal navy oil reserves. Personal gains: when government officials are given privileges, gifts, and money to use for themselves and not on the American people. Another oilman and later to be Governor of Wyoming, Leslie Miller, became suspicious when he saw trucks with the Sinclair company logo hauling drilling equipment into the Teapot Dome naval petroleum reserve. He asked U.S. Sen. John B. Kendrick to look into the matter. Kendrick informed the Senate investigating committee. As the Senate Investigating committee looked into the matter, President Harding took a summer trip west. He visited Yellowstone in Wyoming. He visited Alaska next. Then he went to San Francisco, California. While in San Francisco, the President died suddenly of a heart attack. There was much speculation about how he died. Some people believed he was poisoned. Others believed he had a heart attack from stress - because he knew he was about to be involved in a big scandal. It was not long before the scandal came to light. After a long Senate investigation, Albert Fall, was tried for accepting bribes. He was convicted and sent to federal prison. Albert Fall was the first cabinet member in American history to go to jail for crimes committed while serving in office. Sinclair and Doheny went to trial too. The main charge against them was giving bribes. They were both exonerated on this charge. They did not get away with everything though. Sinclair was sentenced to a 9-month prison term for jury tampering. He hired detectives to follow members of the jury in his bribery trial and was caught. Doheny's fate was arguably worse. It was believed that Edward Doheny had his son, Ned Doheny, deliver the bribe money to Albert Fall. 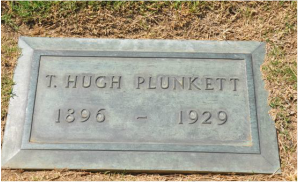 It was also believed that Theodore Hugh Plunkett, a boyhood friend of Ned's and now employee of the Doheny family went with him. In 1929, Ned Doheny and Theodore Plunkett were indicted for bribery. Plunked snapped. He shot and killed Ned Doheny and then turned the gun on himself. Edward Doheny moved away from others and died alone in 1935. Directions: The second thing you need to do is show that you understand what you have just read. In your small groups, answer the questions below in your Lesson 2 - Scandal Lesson Chronicles, under the Explain It Header. 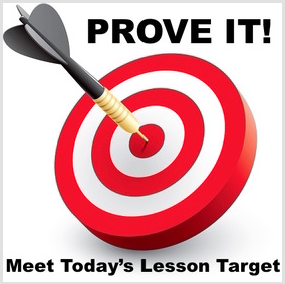 We will discuss these as a whole group when you have completed these in your small groups. 1. 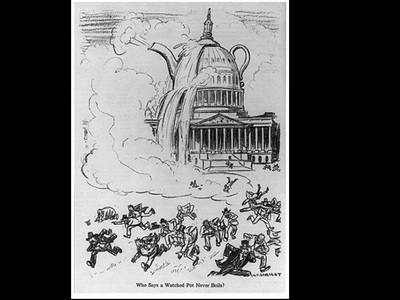 What was the Teapot Dome Scandal? 2. Why did the government establish federally owned oil reserves? 3. 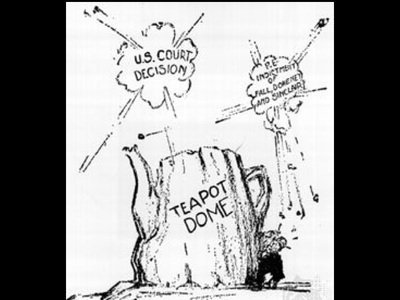 Why was the oil reserve called Teapot Dome? 4. Who was president when the Teapot Dome Scandal occurred? 5. Who was Albert Fall and how was he involved in the Teapot Dome Scandal? 6. What is the U.S. Department of the Interior? 7. Who was Leslie Miller and how was he involved in the Teapot Dome Scandal? 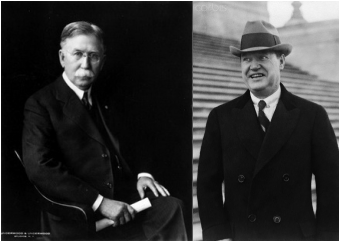 8. Who were Harry Sinclair and Edward Doheny and how were they involved in the Teapot Dome Scandal? Directions: The third thing you need to do is break down what you have read. 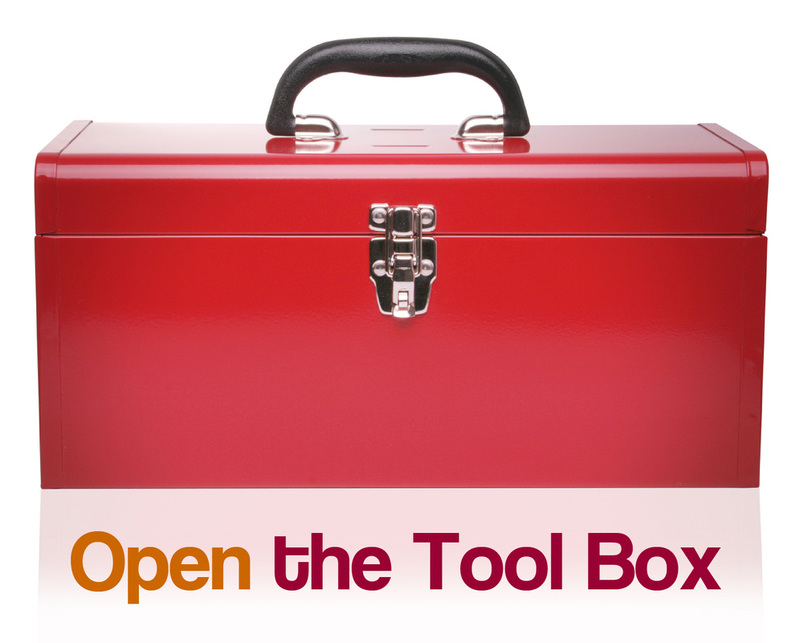 In this activity, we will watch the following two video clips as a class. Then, in your small groups you will race against the other groups to recall any information about the Teapot Dome Scandal that you did not learn in today's reading. Together you will have five minutes to compile a list. The group who compiles the largest list without listing information that was in the reading is the winner. Directions: The fourth thing you need to do is create something with what you learned. 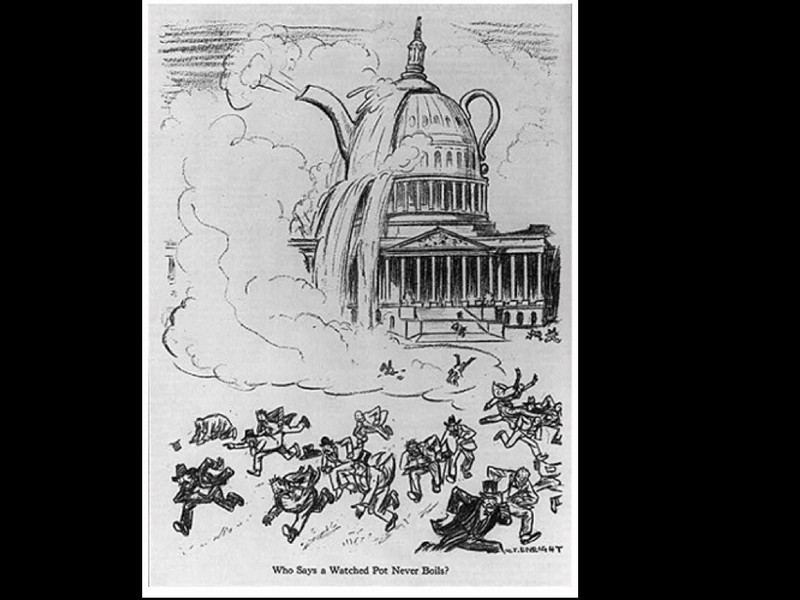 In this activity, you will view some political cartoons about the Teapot Dome Scandal. Political cartoons are illustrations or comics containing a political or social message that usually relates to current events or people. 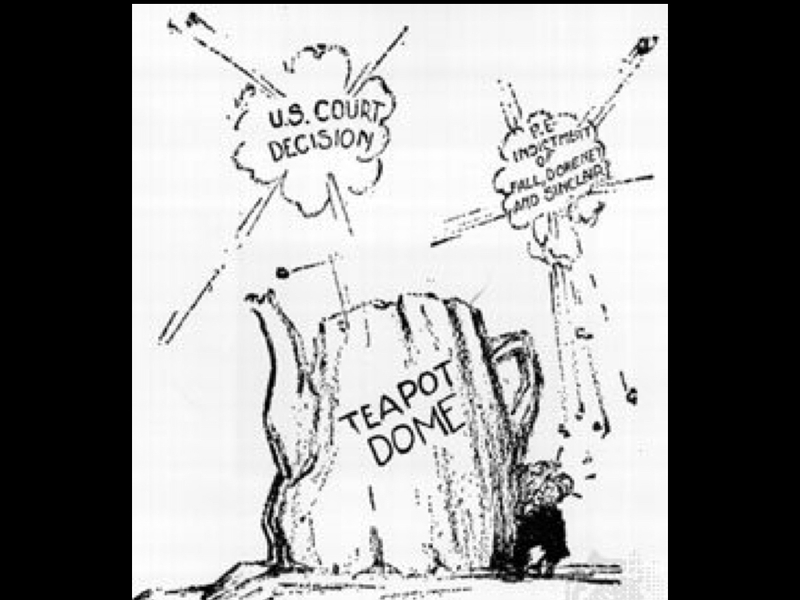 After viewing some of the political cartoons, you will create your own political cartoon about the Teapot Dome Scandal. Use your imagination. Be ready to discuss the meaning of your cartoon. You have completed Unit 4 Lesson 2 - Scandal!